Here’s a fundamental, easy hat to make from balloons. If you like, you can make a good number of these quickly. These helmets are great to make at kid parties or at any event with children (church bazaars, picnics, street fairs, block parties, school nights, etc...). This one is only slightly more difficult to make than a basic balloon hat - you're adding a single step to "finish" the balloon. Like the basic balloon hat, the helmet acts as a base upon which you can add more balloons and make fancier, more detailed hats. This hat also acts as a foundation for the detailed helmet. Once you make a helmet, you’re only limited by your imagination with respect to what you can make. You can learn how to make more balloon hats by checking out our collection of step-by-step instructions. To make the balloon hat helmet, you’ll need to have mastered the basic twist. Inflate the balloon to almost the end leaving a quarter-inch tip. Start with a basic balloon hat. Briefly, starting at the knot end of the balloon, make a small basic twist about an inch long. 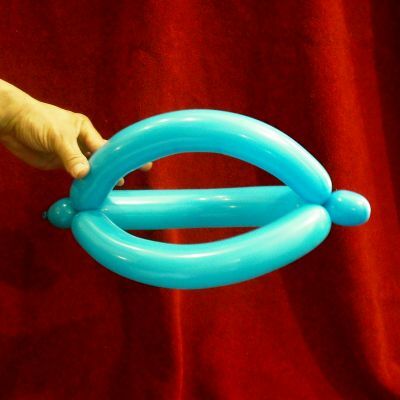 By holding this basic twist, create a loop out of the balloon. You’re trying to create a loop that will be approximately the size (diameter) of the wearer’s head. Twist the basic twist onto the rest of the balloon and lock it in with a few turns. When making hats, experienced balloon twisters create the first quarter-inch tip and then wrap the rest of the balloon around the head of the recipient to physically measure the correct length. After marking the proper length of the balloon, the twister proceeds to the next step. As a genre, balloon hats are rather tricky and unforgiving, particularly the more complex balloon hats such as the crown. If you make a balloon and it doesn't fit the recipient, you can sometimes take your balloon apart and adjust the lengths and then recreate it with the proper fit. But if you're twisting a complex balloon hat, it may be easier to inflate a new balloon and start from the beginning. Take the “tail” of the balloon hat and bend it towards the front of the hat. Make a small basic twist at the end of the balloon and attach it to the twist at the front of the hat. You have created a balloon hat helmet. Again, you can learn how to make more balloon hats by checking out our collection of step-by-step instructions. While the helmet is among the easier balloons to learn to make, it forms the foundation for other balloon hats. A good next step comes in our crazy balloon hat, version 2 and jester balloon hat.